Airy, light and thin with naturally soft materials and skinfriendly natural ingredients aloe vera, vitamin E, chamomille and olive oil. Airy, light and thin with naturally soft materials and skinfriendly natural ingredients*. *aloe vera, vitamin E, chamomille and olive oil. "Every parent wants to give their baby all their love. At Libero, we know that one of the most important tasks of a diapter is to safeguard your baby's healthy skin. And Libero does that in a natural, simple way. They are also constructed in a way that allows the skin to breathe by letting air through in essential parts, while maintaining high leakage security. 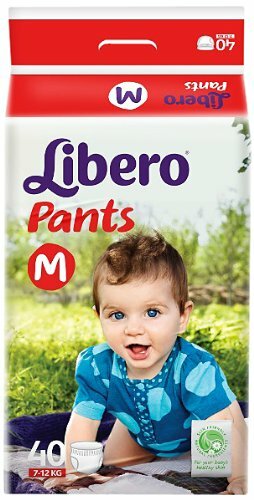 To Recieve updates and possible rewards for Libero Libero Medium Size Diaper Pants please sign in. To Recieve updates and possible rewards for Diapers & Nappies please sign in.